Update Oct. 14: The Mondavi Center has canceled all three Corin Courtyard Concerts, Oct. 14, 15 and 16, due to inclement weather. Free music in the Corin Courtyard (at the Mondavi Center), arboretum programs and the fall open house at the California Raptor Center, from Friday through Sunday (Oct. 14-16). The Mondavi Center for the Performing Arts has scheduled three free, Corin Courtyard Concerts in a row — Friday, Saturday and Sunday — each one in advance of a ticketed program in Jackson Hall. Music the whole family can enjoy: The Hoots will perform ia free concert in the Corin Courtyard. Celebrate “Oak-tober” — It’s acorn season in the oak grove! Explore the Shields Oak Grove in autumn to see oaks from around the world and learn how they prepare for winter. 11 a.m. Saturday (Oct. 15), meet at the gazebo. Will be canceled in the event of heavy rain. Native American Uses of California Plants — Enjoy an engaging, family-friendly tour of the Native American Contemplative Garden and discover traditional uses for a variety of California plants. 2 p.m. Sunday (Oct. 16), meet at the Welcome Center. Will be canceled in the event of heavy rain. The center’s fall open house is this Saturday (Oct. 15), offering up-close and personal encounters with a golden eagle, a red-tailed hawk, great-horned owl and many other birds of prey; and educational talks. The open house runs from 9 a.m. to 3 p.m., but you’re welcome to arrive at 8 for a guided Hawk Walk (bring binoculars). During the open house, raptor center staff will take birds from their cages, for display “on the glove.” Special presentations are scheduled for 10 a.m. and noon. Visitors are invited to follow a self-guided tour through the center, to see the exhibits. The museum also will be open. 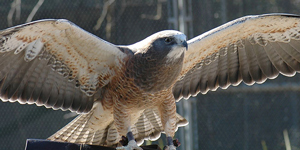 While the open house and Hawk Walk are free, the center greatly appreciates tax-deductible donations that help provide care and feeding of resident raptors, underwrite education programs, provide medication and medical supplies for rehabilitation, and maintain the facility. Parking is free. Directions.